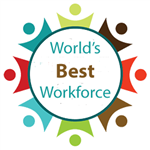 What is the World's Best Workforce Legislation? Minnesota schools strive to provide the best educational opportunities for all children. Providing an education to Minnesota youth that leads to creating the world's best workforce is a goal that must be addressed throughout every child's life. This legislation mandates that districts will develop goals to address identified issues locally. The comprehensive strategic plan that districts create under this legislation is intended to serve as a foundational document to align district educational initiatives from pre-kindergarten to post high school graduation and can serve as a blueprint to create a quality workforce equipped with skills for the 21st Century. The plan is developed with involvement and input from district stakeholders including administrators, board members, teachers, parents, students, business leaders, and community members. 1. Have all students meet school readiness goals. 2. Have all third grade students achieve grade-level literacy. and between students living in poverty and their more privileged peers. 4. Have all students graduate from high school. 5. Have all students attain college and career preparedness.